Pharmaceutical companies conduct clinical trials for many reasons. The most obvious goal of clinical trials is to demonstrate safety and efficacy to gain Food and Drug Administration (FDA) approval. FDA provides guidance to developers about what constitutes acceptable clinical trials and appropriate outcomes. Improving the drug development process, especially by conducting better (meaning providing more information on safety or efficacy) and faster clinical trials, can foster innovation in medical product development. Therefore, by identifying costs, efficiencies, and hurdles throughout the clinical trial process, this report can provide guidance to the industry to assist their drug development process. 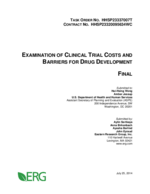 This study, conducted by Eastern Research Group, Inc. (ERG) under contract to the U.S. Department of Health and Human Services (HHS), Office of the Assistant Secretary for Planning and Evaluation (ASPE), 1) examines the pharmaceutical companies’ decision-making process for the design and execution of clinical trials, and 2) identifies factors that may delay, hinder, or lead to unsuccessfully completed trials and 3) develops an operational model of clinical trial decision-making to enable examination of what-if scenarios by end-users. The decision tree adapted from Damodaran (2007) specifies the phases (1 through 4), the development revenue/cost at each phase, success/failure probability for each phase, and the marginal returns associated with each step. Since it takes time to go through the different phases of development, there is a time value effect that is built into the expected returns computation. In the model, we compute the expected net present value at the decision point by working backwards through the tree. Overall, the therapeutic area with the highest average per-study costs across Phases 1, 2 and 3 is pain and anesthesia ($71.3 million) followed by ophthalmology ($49.9 million) and antiinfective ($41.3 million) trials. Conversely, trials in dermatology, endocrinology, and gastroenterology have the lowest overall costs across the same three phases. Average per-study costs across all therapeutic areas increase as clinical development proceeds from Phase 1 to Phases 2 and 3. Average Phase 4 study costs are equivalent to those of Phase 3 costs but are much more variable across different therapeutic areas than Phase 3 costs. Overall, the factors that contribute the most to costs across all trial phases include Clinical Procedure Costs (15 to 22 percent), Administrative Staff Costs (11 to 29 percent), Site Monitoring Costs (nine to 14 percent), Site Retention Costs (nine to 16 percent), and Central Laboratory Costs (four to 12 percent). The major obstacles to conducting clinical trials in the United States identified through this research include: high financial cost, the lengthy time frames, difficulties in recruitment and retention of participants, insufficiencies in the clinical research workforce, drug sponsor-imposed barriers; regulatory and administrative barriers, the disconnect between clinical research and medical care, and barriers related to the globalization of clinical research. Key findings associated with each of these obstacles are provided below. Our analysis suggests that priority review vouchers and improvements in FDA review efficiency can help to shorten timelines, which in turn increase the expected net present value (eNPV) to the drug sponsor. Because these options affect the final stage of clinical research (mainly NDA/BLA approval), heir overall dollar value for a sponsor at the start of clinical research is much lower due to discounting. Therefore, holding everything constant, these options may be less appealing as strategies to stimulate drug development than alternatives which substantially lower costs early on in the clinical research process. Use of lower-cost facilities/in-home testing and wider use of mobile technologies appear to be most effective in reducing costs across therapeutic areas and trial phases. Use of lower-cost facilities and/or inhome testing can reduce per-trial costs by up to $0.8 million (up to 16 percent of cost per study) in Phase 1, $4.3 million (up to 22 percent of cost per study) in Phase 2, and $9.1 million (up to 17 percent of cost per study) in Phase 3, depending on therapeutic area. Wider use of mobile technologies can result in very similar maximum savings; $0.4 million (up to eight percent of cost per study) in Phase 1, $2.4 million (up to 12 percent of cost per study) in Phase 2, $6.1 million (up to 12 percent of cost per study) in Phase 3, and $6.7 million (up to 13 percent of cost per study) in Phase 4. On the other hand, loosening trial enrollment restrictions and reducing SDV efforts have smaller impacts on costs, resulting in maximum savings of less than $0.1 million to $0.2 million per trial, representing approximately one percent of perstudy costs in Phases 2 and 3.